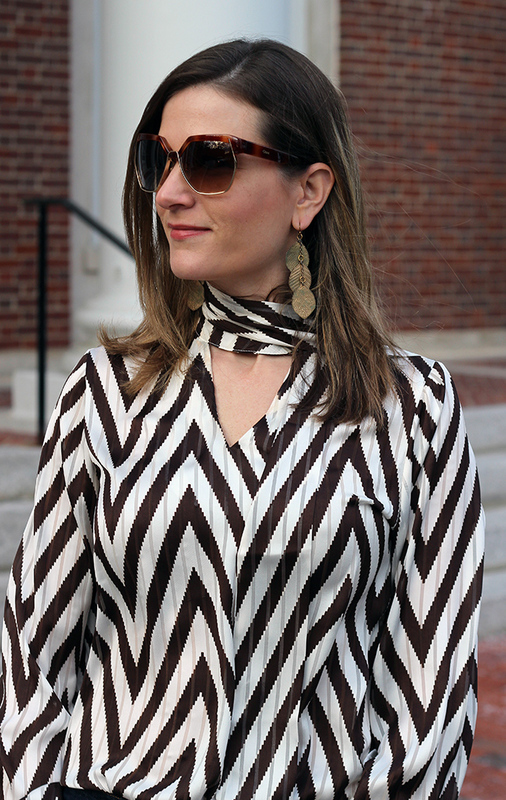 Is there anything that says 70s more than a zig zag tie neck blouse and flared jeans? There has been a large trend towards 70s dressing this season, and although my style tends to be on the classic side, I can't help but to add a little disco fever into my outfits. This blouse is another great find from Chicwish, and I'm loving that the colors are dark brown and cream giving it a retro feel. 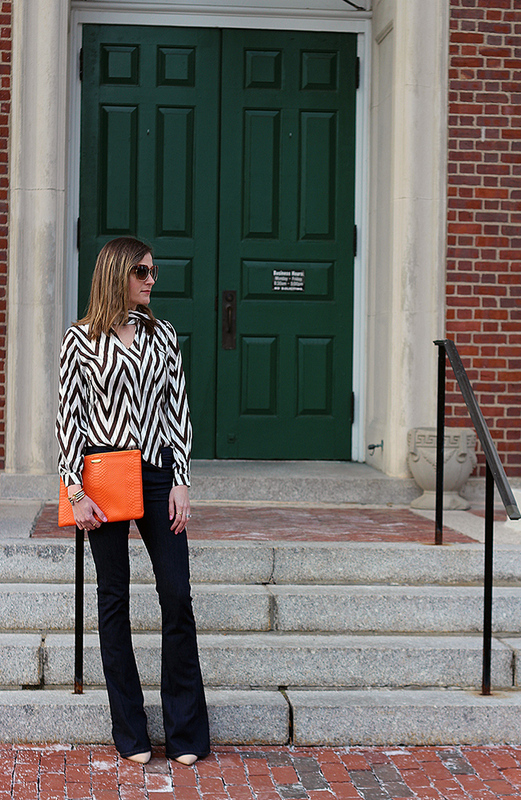 I paired it with my J Brand flares, faux fur coat, and finished my look with an orange clutch. On a different note, happy FriYay! Does everyone have fun plans for the weekend or Valentine's Day? No big plans here, but my sister will be spending the night Saturday, which I'm beyond excited for! Ever since she moved out to the lake (an hour away) we don't see each other nearly enough. Other then that, I will be keeping up with everything New York Fashion Week related from the comfort of my couch. Wishing everyone a happy weekend. Sometimes if I stare a little longer on a zig zag print it gives me headache. Haha.. you style it very nice here !!! Gorgeous! 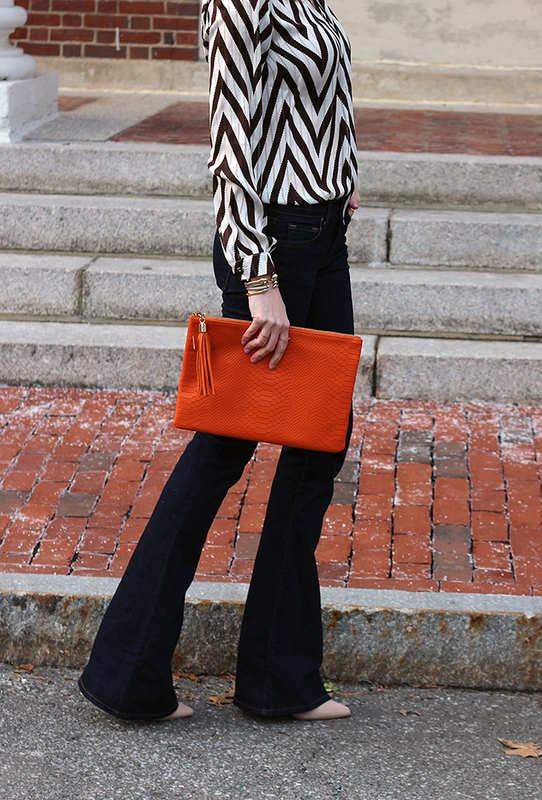 Love the flares and added stilettos. We don't have any plans on the actual Valentines day as hubby has to work so we might plan on a date night next week. Hope yours is good. Thanks for hosting! Such a fun 70s look! 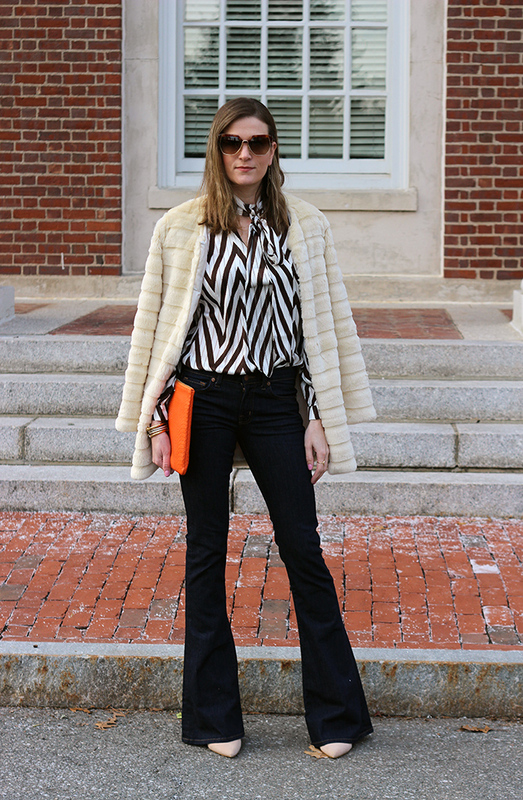 Loving the tie blouse with your flares and fur. You're rocking the 70s vibe with this look - Have a lovely VDay weekend! Loving this 70s vibe on you!!! I love this vintage look and those Chloe sunnies. Check out the designer Oliver Goldsmith, you will love his sunglasses. Audrey Hepburn and stars of the past wore his designs. Visit our site to see his brand. Thanks for sharing and check out our Valentine's Day Special! That fur coat is amazing! Yes, I have big plans for Valentine's Day! A Broadway Tour of the musical "Newsies", dinner out, and hotel in the big city! Can't wait! Happy Valentine's Day! Rachael, you doll, you could be IN NWFW! I love the outfit! No plans for St. Valentine's Day here. We'll just hang together huddled inside this weekend. Sounds like you will have a ball with your sister spending the night! Enjoy the weekend! What a chic outfit from the unique and fun striped blouse, coat and pants! I love the texture your coat adds to the entire look. What a cute top! 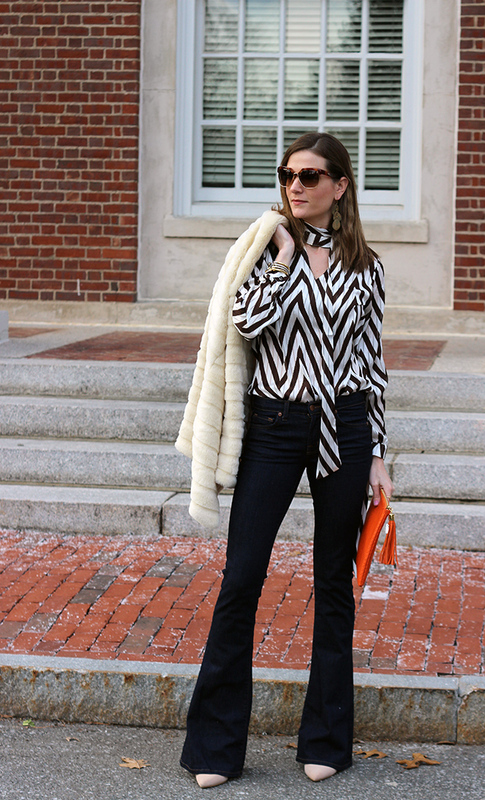 Love the zig zag stripes and that amazing coat! Loving this 70s look! Your legs look miles long in those flares! So gorgeous! Hope you enjoy your weekend! Love the pattern on your top! Chevron is my all-time favorite pattern. What an incredibly wonderful outfit! Absolutely love your fur coat and the jeans! Such a stunning look babe!! Those jeans are amazing! You look amazing! Obsessed with those flares and that fur jacket is so chic! Killing it in this outfit! 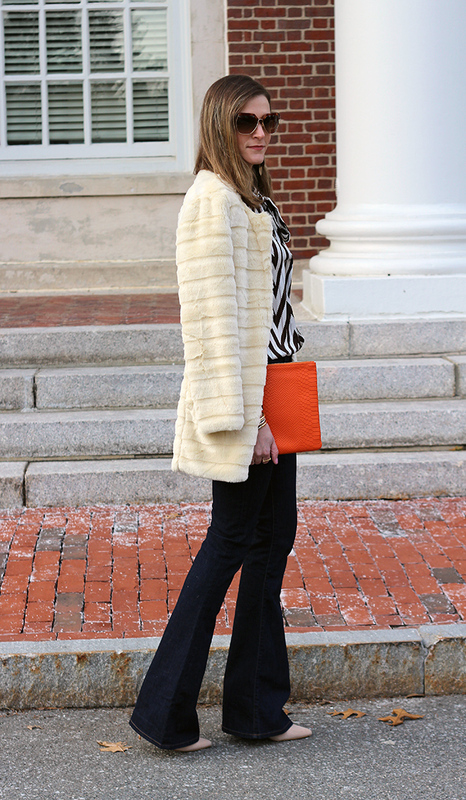 That silk blouse with the fur coat look so comfy together, and love the pop of color in the clutch! Very chic and effortless look! My eyes are definitely drawn to the bold prints on your blouse. Perfect outfit for a casual Friday. So vintage and fabulous!! Love! That blouse is beautiful. I am a sucker for a bow-tie blouse. The pattern and texture of this are gorgeous, too. Love the 70s glam vibe here.